Sri Lanka is one of our all-time favourite places to visit. Each year in February we spend two retreats on this beautiful island, sipping fresh coconuts, surfing the waves and soaking up the culture – of course with plenty of yoga in between. We’ve compiled a list of our Top Ten Sri Lanka destinations (in no particular order), for those that love travel, culture and adventure. Galle is a major city in Sri Lanka, located on the Southwestern tip of the island. It is a beautiful and exotic city, boasting a collection of attractive Dutch buildings. Galle is a city of trade, and today the historic Fort area is crammed full of little boutique shops, cafes and hotels. These are mostly owned by local and foreign artists, writers, photographers, designers and poets. 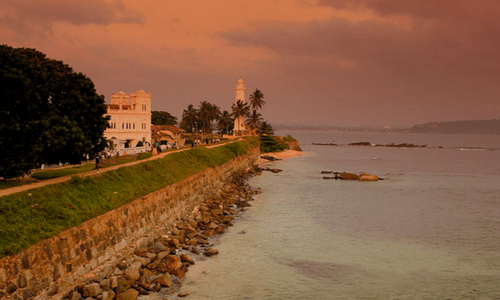 A day trip to Galle is included in our Sri Lanka holidays. 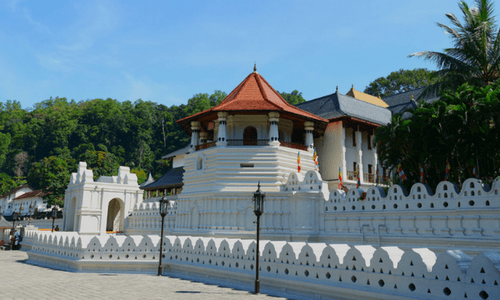 The Temple of the Tooth is a Buddhist temple in the city of Kandy. It is located in the royal palace complex of the former Kingdom of Kandy, which houses the relic of the tooth of the Buddha. Since ancient times, the relic has played an important role in local politics because it is believed that whoever holds the relic holds the governance of the country. Kandy was the last capital of the Sri Lankan kings and is a World Heritage Site mainly due to the temple. Wijaya Beach is set in a beautifully ambient setting, with a beachfront restaurant serving an eclectic mix of European and Asian foods. The peaceful beach has a protective reef creating a lagoon that ensures safe swimming year round. There is also a small surf break in front of the restaurant – perfect for beginner surfers. 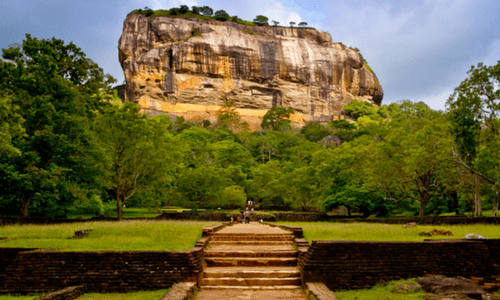 Sigiriya is an ancient rock fortress located in the centre of Sri Lanka. It is dominated by a massive column of rock measuring nearly 200 metres (660 feet) high. According to the ancient Sri Lankan chronicle the Culavamsa, this site was selected by King Kasyapa (477 – 495 CE) for his new capital. He built his palace on the top of this rock and decorated its sides with colourful frescoes. On a small plateau about halfway up the side of this rock, he built a gateway in the form of an enormous lion. The name of this place is derived from this structure —Sīhāgiri, the Lion Rock. The capital and the royal palace was abandoned after the king’s death. It was used as a Buddhist monastery until the 14th century. Bentota is a town located near Galle, known for its beautiful beach and river. 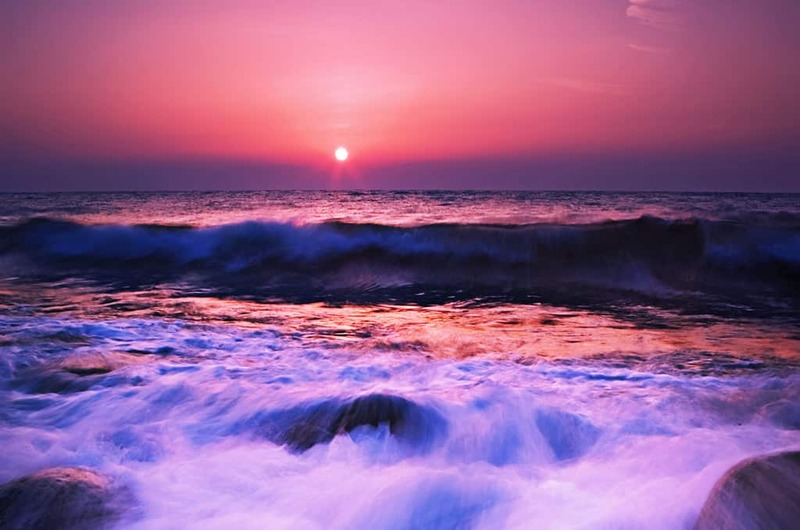 It is a popular destination for water sports, as well as delivering the ancient healing art of Ayurveda. Bentota is also famous for its toddy production, a beverage made from coconut nectar. Near Bentota, you can find the famous Kande Viharaya, a Buddhist temple featuring a statue and mural paintings. We host our popular Sunshine and Yoga retreats in Bentota every year in February. Between the months of November and April, Sri Lanka is one of the greatest places to discover whales and dolphins in their natural habitat. Blue whales, sperm whales, orcas, pilot whales and dolphins are regularly spotted on boat trips, as the deep waters provide an ideal feeding ground for their migration season. 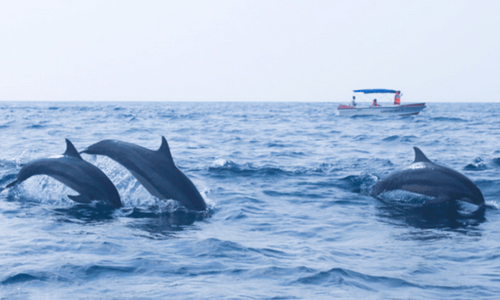 Dondra has become the main spot for whale watching, and in Kalpitiya you can witness up to 1500 dolphins in a single trip. 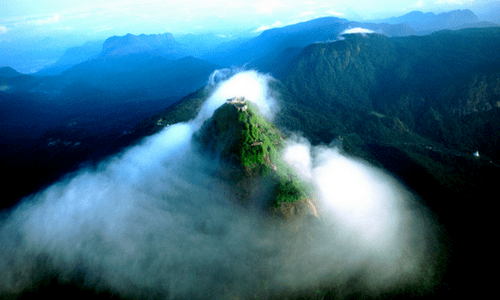 The Knuckles Mountain Range lies in central Sri Lanka. The range takes its name from a series of recumbent folds and peaks in the west of the massif which resembles the knuckles of a clenched fist when viewed from certain locations in the Kandy District. The entire area is often robed in characteristic layers of cloud. In addition to its aesthetic value, the range is of great scientific interest. At higher elevations, there are a series of isolated cloud forests. 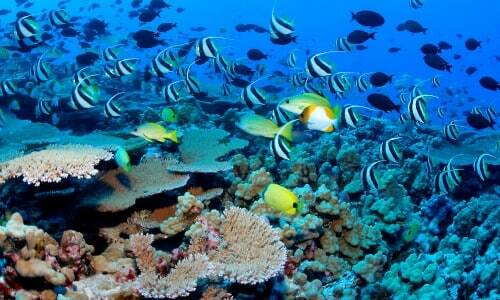 They host a variety of flora and fauna, some of which cannot be found anywhere else in the world. Yala is situated in Sri Lanka’s Southeast and hugs the panoramic Indian Ocean. It was designated a national park in 1938 and has a protected area of nearly 130,000 hectares of land. This consists of light forests, scrubs, grasslands, tanks and lagoons. Yala is home to 44 varieties of mammal and 215 bird species. 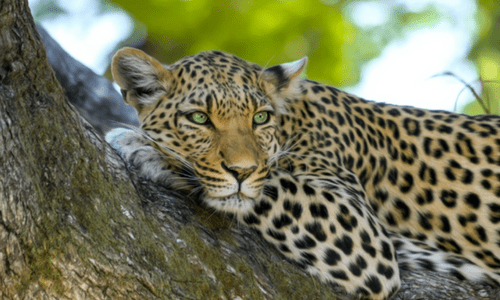 Among its more famous residents are the world’s biggest concentration of leopards, majestic elephants, sloth bears, sambar deer, jackals, spotted deer, peacocks, and crocodiles. Buddhists – claim the footprint mark is the left foot of Buddha. Hindus – consider the footprint to belong to none other than Lord Shiva. Muslims and Christians – believe it’s Adam’s first step after being exiled from the Garden of Eden. 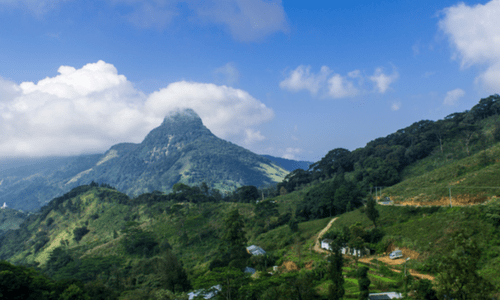 Other popular things to do near Adam’s Peak include visits to the spice farm and tea plantations and take a waterfall tour. Hikkaduwa is a small town on the Southwestern coast of Sri Lanka. It boasts a beautiful sandy beach with plenty of restaurants and shops. Other attractions include excellent local surf, plus good diving and snorkelling. Beach and sea aside, there are also several interesting Buddhist temples around Hikkaduwa. These are all easily reachable by tuk-tuk or bicycle. 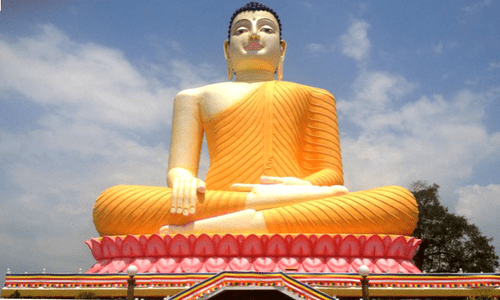 You can experience the tropical and spiritual ambience that Sri Lanka has to offer on our Sri Lanka holidays, held yearly in February in the beautiful location of Bentota. Join us and see all the island has to offer and get a better insight into our top ten Sri Lanka destinations.